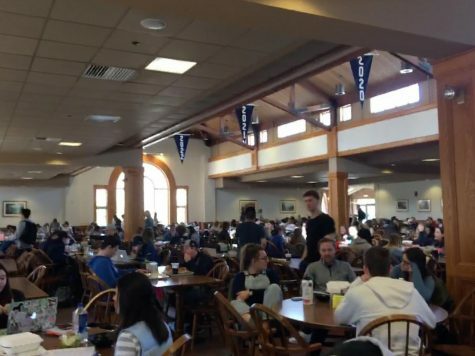 Saint Anselm College’s prestige for its food is widely known; it has been consistently ranking 8th nationally for best food according to the Princeton Review. How well does it do, however with non-standard diets? Many people on campus have dietary restrictions to varying degrees of severity. Many students have allergies to nut products. Some students avoid certain meats for their faith, and others have to avoid gluten. A small (but no less important) group of students opt to eat vegetarian and vegan for personal reasons. Approximately 24-50 vegetarian meals are prepared every day, according to the director of Dining Services Rosemary Stackpole. She is committed to creating an accommodating menu for all students on campus. “Be proactive. Come to me if you feel you’re missing something. Tell us, and we’ll bring it in. Easy fixes. I’m always open to new ideas,” she said. Though everything in Davison is labeled, Stackpole did confirm that nut products are never used on the hotline, nor is soy oil used in the kitchen. Vegetarian students on campus are overall pleased with the college’s effort to maintain wholesome options. Though Saint Anselm has a supportive dietary program for a minority of its students, a few minor critiques still rose to the surface. Stackpole commented on this critique, highly aware of the dangers of cross-contamination which could occur by using the same cooking service for vegetarian and non-vegetarian meals. “If someone is a strict vegetarian in this sense, they can e-mail me or my assistant, and we can make sure that a veggie burger can be prepared separately in the kitchen for them, away from the main grill,” she said. Other critiques were addressed in terms of diet balance with Saint A’s vegetarian and vegan options. No system is perfect, but Saint Anselm does strive to provide wholesome meals on campus which benefit every student possible. Though dietary restrictions do impose irritating limits, meals such as the vegetable wrap/hero at the Coffee Shop, or the stuffed pepper, bean ragout, and baked stuffed acorn squash in Davison Hall do offer some relief. Most importantly, Dining Services want an open channel of communication with students who have concerns about the college’s meal program.